Note: This structure is valid for Plesk 12.x and Onyx. Each backup consists of <info>.xml (backup metadata files), <backup>.<zip|tar> (archived backup files which include website content, databases, etc.) and the directory .discovered , which contains backup technical information. The backup is identified by the data number, and the list of all files included in the backup can be found with the command find . From the output above it is seen that this is a backup of a client with the login mydomains which owns the domain example.com with the mail account john.doe@example.com . The backup of this client includes the backup of the domain it owns. Warning: Modifying Plesk backup is not recommended. The Plesk backup repository is $DUMP_D (the default location is /var/lib/psa/dump ). Below are the descriptions of directories corresponding to personal backup repositories accessible through Plesk. Root backup directory where server backups and subdirectories with backups of resellers, clients, and domains are stored. Subdirectory where backups of domains owned by the administrator are stored. Subdirectory where backups of clients and their domains are stored. The repositories are identified by client login and domain name. 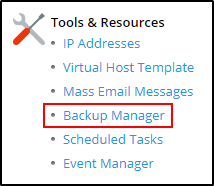 Clients > client_name > Domains > example.com > Backup Manager . Subdirectory where backups of resellers, their clients and domains are stored. 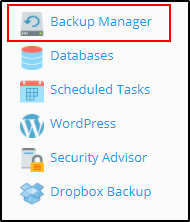 Resellers > reseller_name > Client Accounts > client_name > Domains > example.com > Backup Manager . If there is a plan to migrate objects to a new server, move the root backup directory as a whole. Foreign files located in the backup repository are not visible through Plesk. status_OK indicates the status of the backup. status_SIGN-ERROR for a modified backup in which the backup signature does not match the backup content. This notification is shown in Plesk when you click on the backup: "Warning: This backup was created on another server or modified after creation." Note: The status backup file is kind of like a cache. You need to remove it to allow Plesk Backup Manager to generate a new status file. Where is a backup folder located on the server? Which data is included in the incremental backup?